Phewww… I truly am smiling when typing this down. This evening, my flawed necessity of buying things has been fulfilled. Shamed on me. Only yesterday I promised myself to watch over my financial stability, promised not to spend excessively and definitely promised myself not to, not to buy things that I don’t need. I can’t fight with all might that I have (or least restore deep down in my soul) I surrendered without even put a fight, hands were in the air, I walked through shops, little battling against needs and desires and finally, the desire have won. 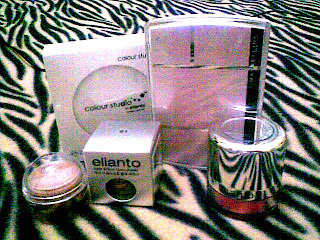 And for me, only some makeup from Elianto and Maybelline, and my skin’s stuff from Shadira. Not much. Just nice cause my stock is running low. O0psy!~ another addiction contaminating my contaminated brain~ FOOD SKIN. Before this I never gave a second look when I walked past this shop, but I don’t know why, this evening~it was like I’m being possessed by some supernatural power, the moment I walked past the shop, I took a second glimpse on the stuffs that have been arranged accordingly on the racks and suddenly, I’m so eager to find out more about its stuffs. 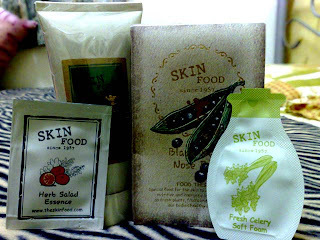 Food skin is basically a line of skin therapy products ranging from sensitive skin’s products right up to oily skin’s product. Its ingredients basically from the natural resources such as typical and exotic fruit, black bean, coffee bean, cholera and many more. Some of it caught my eyes. Moreover, I’m looking for a scrub and peel-off mask and eventually I found something in the shop. p/s: I want the Guess’s perfume s0o0o0o0o bad!! !